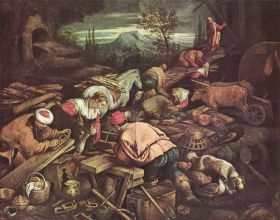 Jacopo Bassano (also known as Giacomo da Ponte, c. 1515 - 13 February 1592) was an Italian painter who was born and died in Bassano del Grappa near Venice, from which he adopted the name. 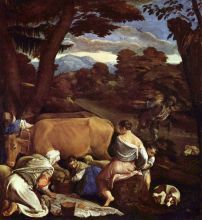 His father Francesco Bassano the Elder was a "peasant artist" and Jacopo adopted some of his style as he created religious paintings with novel features including animals, farmhouses, and landscapes. 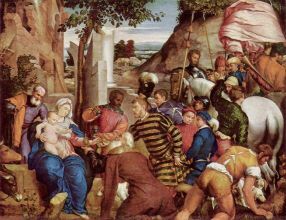 He trained initially with his father, Francesco da Ponte the Elder, then in the studio of Bonifacio Veneziano. 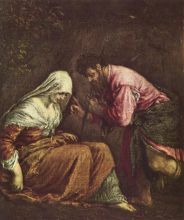 His mature style, however, followed the example of Titian. 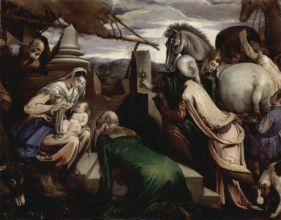 Having worked in Venice and other Italian towns, he established a workshop in Bassano with his four sons: Francesco the Younger (1549–1592), Girolamo (1566–1621), Giovanni Battista (1553–1613), and Leandro (1557–1622). They shared his style, and some works are difficult to attribute precisely. 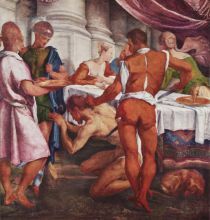 While he learnt from other artists of the time, his relationships with them varied, notably when he portrayed Titian as a moneychanger in Purification of the Temple. 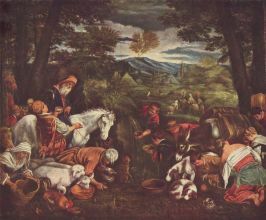 Other particularly notable works include Jacob’s Return to Canaan, Dives and Lazarus, Acteon and the Nymphs, The Last Supper and Annunciation to the Shepherds.